Japanese Episode AG 121: "Satoshi to Haruka! Houen de no Atsuki Batoru!!" 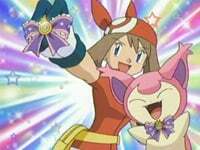 Now that Satoshi has eight gym badges and Haruka has five Contest Ribbons, it's time to look back on their most memorable moments. The clip show starts by focusing on Satoshi's gym battles. In his first gym match, his Pikachu faced Tsutsuji's Nosepass in Kanazumi City. His second gym match pitted his Kimori against the Muro Town Gym Leader's Hariteyama, who was eventually defeated in a rematch. After receiving his third and fourth gym badges, Satoshi faces off against Senri, the Touka City Gym Leader. Satoshi had fought Haruka's father before, but this time he has enough pokemon to come out on top. After receiving his sixth and seventh gym badges, Satoshi's final gym match pits him against the Rune City Gym Leader, Adan. Adan's powerful water-types put up a good fight, but Satoshi's Pikachu is able to win when it uses the fact that water conducts electricity to its advantage. The second half of the clip show focuses on Haruka's Pokemon Contests. She loses her first Contest, the Kaina Convention, but is able to leave the city with a new rival named Shuu. She faces off against Grace at the Hajitsuge Convention, and is able to come out victorious at the Shidake Convention. When she enters the Ruibosu Convention, her newly caught Fushigidane is unable to earn her a fourth ribbon. Haruka has better luck at the Minamo Convention against Kanata, and her battle at the Purika Convention against a new rival named Harley ends in a victory as well. Her final competition, the Kinagi Convention, saw her Eneko face off against a Rougela belonging to a Coordinator named Eriko. Using Eneko's risky Cat's Hand ("Assist") technique, Haruka is able to score a fifth contest ribbon. Now that Haruka has all her ribbons, she stands outside the entrance to the Grand Festival, ready to take on any competition that comes her way. It's finally happened. After eight years of resisting the temptation, the anime producers finally break down and give us a clip show. Now the episode does have 24 seconds of new footage at the end of the episode, but the majority of this episode is made up of clips from older episodes while the narrator talks us through the battles. Clip shows don't necessarily have to be bad (look at Samurai Champloo), but this one is just awful. The clips themselves are good, and the anime producers do a fine job of focusing on each battle. However, the whole episode comes off as extremely lazy since the TV producers don't re-edit any of the music at all. Whenever a clip is played, whatever music was playing at that moment in that episode is played along with it. That makes sense and all, but when the episode's producers skip ahead to a clip further along in the episode, the music skips along with it. This happens way too many times for it to be a one-time mistake. There's also a portion where the narrator is having to talk over the audio of one of the episodes because the episode's producers couldn't be bothered to mute the clip they were showing. This is, without a doubt, the laziest clip show I've ever seen. 4Kids didn't dub this, and the general feeling is "Who cares? Nobody likes clip shows anyway." Eh, fair enough. I would have liked to see 4Kids handle this episode (they did that one Yu-Gi-Oh! episode) since they could have fixed the music problem present in the Japanese version. Oh well.